Google is going through a rough patch this week – and things just got a little worse for the Mountain View company. In its latest monthly software review, independent antivirus testing firm AV-TEST inspected Google’s Play Protect – the Google Play antivirus system put in place to guard your phone from malicious apps – and found it to be significantly less reliable than most third-party alternatives. In fact, the research suggests that, on average, Play Protect performs more than 25 percent worse than competing solutions when it comes to detecting infected software. This makes Google’s antivirus program the least trustworthy solution out of the 21 security apps AV-TEST examined. 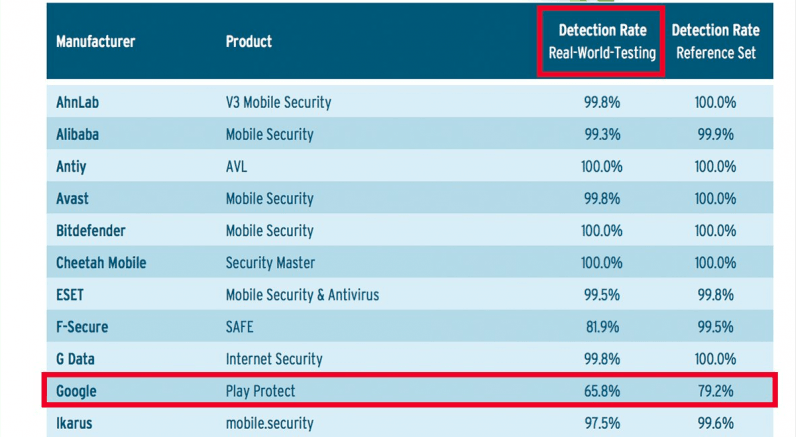 For context, Play Protect was able to detect only about 65 percent of all infected apps. By comparison, the second worst-performing antivirus system, Droid-X 3 from NSHC, was able to maintain a detection rate of 82 percent – almost 20 percent higher than Google’s app. This is the very first time AV-TEST has opted to dig into Play Protect’s defenses after Google rolled out the system to all users earlier in July. What is particularly troubling about Play Protect’s poor score is that Google Play has suffered from a deluge of malicious apps. Indeed, the company purged over 25,000 infected apps from its software distribution platform back in January. Still, reports suggest 350 new Android malware apps pop up each hour. That is, in addition to the Play Store fake review epidemic the Mountain View behemoth has been struggling to curb.